BLACKSTONE, Mass. 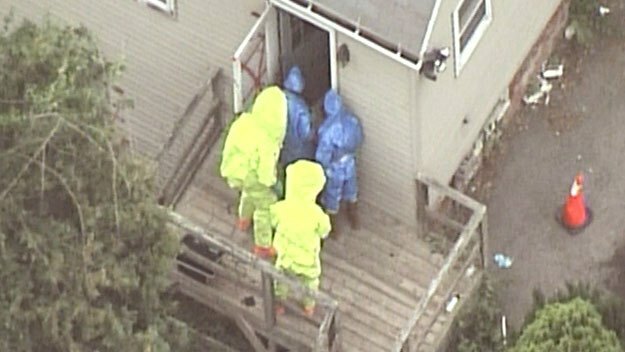 -- The bodies of three infants were discovered in a Blackstone, Mass., home on Thursday by investigators who entered it wearing hazmat suits, CBS Boston reported. Worcester County District Attorney Joseph A. Early said there are currently no homicide charges against anyone in connection with the deaths of the children, who remain unidentified. Two weeks ago, four children aged 13 years to six months had been removed from the house by the state Department of Children and Families. But after the discovery of the three other children, Early said the house, which was in poor condition, had been condemned. "The house is in squalor," said Early. Cayenne Isaksen, spokesperson for the Department of Children and Families said the discovery is part of an ongoing criminal investigation and the children that were removed are in the custody of her agency. She said DCF never had an open case with the family.